Good shelter is essential to an agricultural business. This is why horses, livestock, hay, grain, crops, and farm equipment all need protection from the elements. Quonset Barn Kits, or Steel farm buildings are much stronger than the traditional old fashioned wooden pole barns. They are maintenance free, and are available in many sizes and models to suit your needs. Because of their steel construction, Quonset Barn Kits are sturdy enough to withstand anything that Mother Nature can throw at them. Powerbilt Steel Buildings, Inc. manufactures its pre-engineered Quonset Barn Kits to go up easily so you can begin using your steel building right away. Powerbilt has over 40 years of experience with steel buildings. They are also the leading manufacturers of pre-engineered Quonset Barn Kits. They are dedicated to providing the highest quality Quonset Barn Kits and unsurpassed service at factory direct prices. All of their Quonset Barn Kits offer a 40 year rust through warranty. Powerbilt uses only the highest quality and heaviest gauge commercial U.S. steel. All of Powerbilt’s buildings are made using 100 percent U.S. labor. The precision manufacturing and design meets or exceeds industry standards. Each kit includes an assembly manual that is easy to follow, ensuring ease of construction. 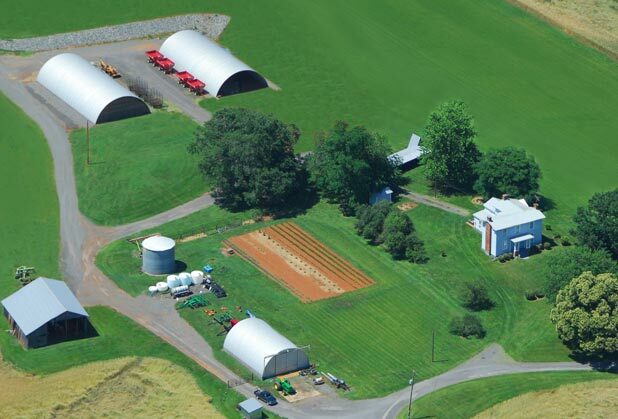 Powerbilt’s Quonset Barn Kits provide the best solution to your agricultural storage needs. Powerbilt delivers factory direct to your location. Easy scheduling, delivery and community freight of their Quonset kits ensure savings on delivery costs. Powerbilt also promises an extremely quick turnaround, with factory stamped drawings typically arriving seven days from receipt of order. Highly trained building consultants are available to discuss your needs, answer all your technical inquiries, and price a pole barn to your specifications within 24 hours. Let Powerbilt Steel Buildings fulfill your agricultural storage needs today with a new Steel Quonset Building Kit. Get an online quote now or call +1 (800) 547-8335 today to speak with a Quonset barn kits specialist.